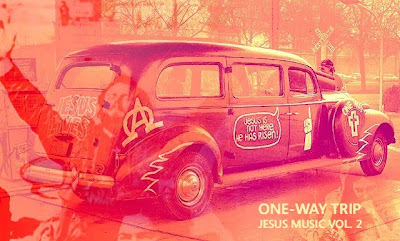 So, here it is....Jesus Music Volume 2. We came across so many interesting tracks in our preparation for volume 1 that there was no way we could fit them all into one mix....on the other hand, some of these songs were just too good to pass up. In fact, we still have a surplus of artists that need to see the light of day, so you can expect a third mix within the months to come. But for now, enjoy the mix, below, that we, (Josh & Doug), have worked cooperatively on. While the musical flavor is slightly different from the songs on the first mix, there are some really solid tunes included here. All the tracks are performed by artists involved in the Jesus People Movement of the 60's and 70's- this fact, is more apparent in some of the selections than in others. Either way, they're definitely some great, "little-known" songs that we think are fun to get down with. Get it here or go down a little further and listen to it track by track. Feel free to let us know if you can roll with it. 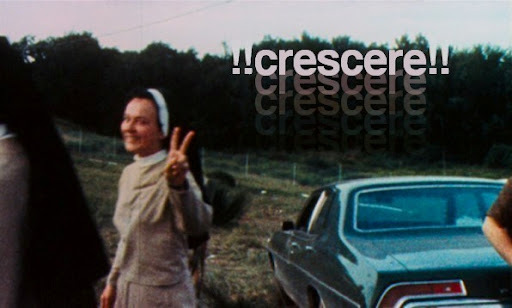 "01)The New Creation: Countdown To Revolution (excerpt)"
"02)Bob Desper: The World Is Crying For Love"
"04)Holy Ghost Reception Committee #9: There's A Voice Inside"
"05)Jim Valley: All Is Well"
"07)Rainbow Promise: Do You Hear"
"09)Mind Garage: The Electric Liturgy- The Lord's Prayer"
"11)Lonesome Stone: Where Do We Go From Here?" 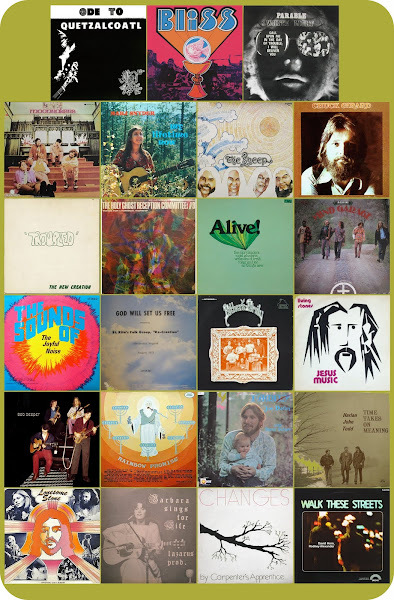 "13)Chuck Girard: Everybody Knows For Sure"
"15)Harlan, John, Todd: Keep Me Through The Weak Parts"
"16)Hidden Manna: Death In The City"
"17)All Things New: Ones, Twos, and Threes"
"19)White Light: Now I Realize"
"20)Marj Snyder: High On The Love Of Jesus"
"23)The Joyful Noise: Amazing Grace (House of the Rising Sun version)"
Wow, man....you found some great songs!!!! I love the bass line in the Carpenter's Apprentice track.....and the "ooohs" in the Harlan John Todd song go super with the bass and harmonica. All Thing New, White Light, Living Stones....they're all great, man....This has been fun. Thank you for the long overdue exposure of these incredible albums/artists. I have spent the last two years listening to nothing but "Jesus Music/Jesus Freak Folk/Xian Psychedelia". These artists have had such a huge impact on my approach to songwriting. Especially on my latest album. I am thankful everyday for their contributions to not only music, but also their honest and encouraging, faith in Jesus. Keep up the good work! - Damien Jurado / Seattle, WA. thanks for the heads up, Holly, and thanks for listening!!!! Damien, thanks for checking us out and posting your comment. It really hit the spot. It's cool that this music inspires you like it does us. We're big fans of your work and can't wait to get our hands on "Maraqopa". Thanks for vol 2 of your Jesus music/Xian comp. A nice cross section of styles, hope you do a vol 3. Any chance you could re-up the re-up? And volume 1 also? Jesus and I will love you more.